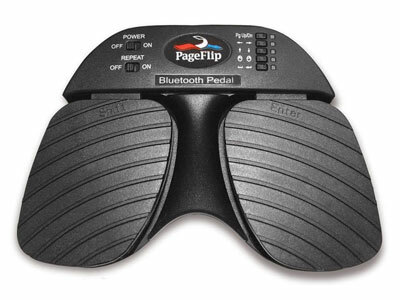 Flip or scroll through your Sheet Music, documents or photos with the hands free convenience of the PageFlip! If your software or app (Windows, Mac or Linux) uses keyboard strokes, the PageFlip will emulate this. Couple this with the Peak iPad stand and now your in business! Use with keyboard-compatible apps such as forScore, MusicReader, unrealBook, Deepdish GigBook, and OnSong. This device operates off two AA batteries or an included USB power cable.